Description: Nearly 60 but Still beautiful! Description: AZER 6070 is far from Arizona as it sits under the Chicago Skyline. Description: Arizona Eastern E8 6070 backs around the Canal Street wye. Description: AZER 6070, the Gila Tomahawk, backs onto the BNSF at Canal Street for access to the airline. Description: The Gila Tomahawk now heads onto the St. Charles Airline. Description: The 6070 continues its climb up the airline. Description: AZER 6070 passes by the Sears Tower, something it did many times back when it was still a Metra unit. Description: Arizona Eastern E8 6070 blasts south through Manteno at track speed with a excursion. Description: Did not come out like I wanted to, but at least I got it. R.P.C.A Excursion Train special to Indy, by High Iron Travel.. Description: Amtrak Extra 971 is a special train headed from Chicago, IL to the RPCA Convention in Indianapolis, IN. Description: Amtrak Extra 971, the special going to the RPCA Convention in Indianapolis, IN, rounds the curve off of the mainline at Effingham, IL. 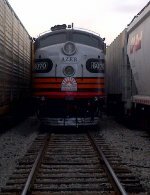 Title: AZER 6070 goes east on Illinois Central rails for a rare move. Description: The famous AZER 6070 visits the Indiana with snow. Description: In cab view of AZER 6070. Description: AZER 6070 head on. Description: The RPCA excurion has departed Indianapolis on its roundabout return to Chicago via the Indiana Railroad and Canadian National. Description: AZER 6070 leads the High Iron Passenger Special across the massive Tulip Trestle. Description: AZER 6070 leads the High Iron Passenger Special at Switz City. Description: AZER 6070 sits in Sturtevant on the wye. Description: AZER 6070 is Wying at 18th St to face the engine north, then will cut it's cars, & engine return home on it's own. Description: High Iron Travel's Dining with Pullman train sits on the east end of Amtrak Yards as Yard Job YC3 before getting allowed to enter CUS to pick up it's passengers. Description: AZER 6070 heads light through Franklin Park, heading back to the Chicago Terminal in Bensenville. Description: AZER 6070 enters Chicago Terminal trackage at Bensenville.